The 7 Eleven store released the results of their experiment held from March 23 up to April 1. 2016. And the leading presidential candidate was the tough-talking PDP-Laban presidential aspirant Rodrigo Duterte. 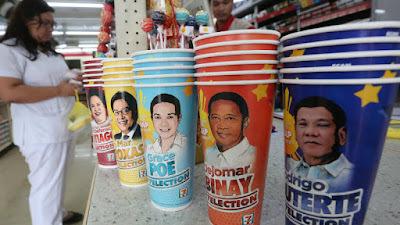 The store used the soda cup and print the faces of the five presidential namely, Roxas, Poe, Duterte, Binay and Santiago. According to the store management, the recent mock poll was conducted in more than 1,500 convenience stores nationwide, winning more than half of the votes. And more interestingly in the poll results was no one from other candidates become second to Duterte. The 14 percent are of the voters/customers in the mock poll said they were still undecided on their presidential candidate, then the 11 percent of vote was placed to Sen. Grace Poe and followed by Sen. Miriam Defensor-Santiago with 6.3 percent and Vice President Jejomar Binay garnered 5.9 percent and the last with 4 percent of the vote given to Mar Roxas. According to Inquirer, the 7 Eleven Corporation introduced the campaign in the United States during the 2000 presidential elections. The company predicted the the wins of former President George W. Bush over then Sen. John Kerry in 2004 and President Barack Obama over Sen. John McCain in 2008. What do you think on the results of the mock elections of 7 Eleven? Share your thoughts below. Comments or suggestions about "Duterte leads on 7 Eleven ‘Slurpee’ poll result " is important to us, you may share it by using the comment box below.